Another one for theme Maternity & Beyond. This is a set of global mods that make having kids possible and comfortable for young adults and sims living on campus. 25 May 2018: added "join greek fix"
22 Apr. 2018: added "alien pregnancy for YA's of any gender"
04 Feb. 2018: added "teens stay teens"
17 oct. 2017: improved "move out of college" and added new mod "uni dorm rooms"
Run Hack Conflict Detection Utility to make sure these hacks don't clash with anything you have in your Downloads folder. Get some clothing fixes (I'll explain it). And you're set! Conflicts: probably InTeenimater. Maybe not directly, but InTeen already covers aging at university, so it has a potential to cause some weirdness, like sims aging twice a day or something. Example: if you want sims to age everyday at 18 pm, choose Uni-aging-each-1-day. This is custom controller that operates only in Uni 'hoods on livable lots. It does its thing quietly, no actions needed from you. If so happens that you have other custom aging controller that works on campus lots, you can stick to that one, if you like it better. You don't want to have more than one. Note that teens on campus don't stay teens for very long - they get instantly "fixed" into young adults, usually on lot load. You'll find a mod to prevent that down below. - Wild Child - Darkwolf Jr. updated the mod so it can be used with mine and posted new topic. Get more info there. Try for baby interactions are available to young adults (whether on campus or not). Actions are NOT autonomous. In uni, for pregnancy to advance, you'll need Uni-aging-each-N-day. OR other custom aging controller that supports pregnancies on campus lots. Young adults may get pregnant after alien abduction. Dropping out, getting expelled, or using up the time after graduation. Available for students in college, unless you use some mod that pulls this procedure in main 'hood. Normally, the game prompts young adults to age up to adults and move out. This mod lets them choose - to move out or to stay. They still age up. Normally, they move out alone. This mod lets them take other sims with them, except for young adults that haven't graduated yet. They can choose who to take along and even move out the whole household. They can not leave kids or pets without a guardian. Normally, the budget is decided automatically by the game. This mod allows to specify it precisely. Sims can take any part of current funds from nothing to everything. If they take at least $1, that's what they end up in 'hood bin. If they take nothing - they receive $20.000 "government aid". After moving out sims can be found in main 'hood family bin. Phone call option to move back to primary neighborhood. Normally, it's available to graduated young adults on college lots before they used up their remaining time. This mod opens the phone call to adults and elders that happen to live at university. Young adults are forced to age up to adults as usual. Adults and elders, of course, aren't. Sims can take other sims with them, except for young adults that haven't graduated yet. They can choose who to take along and even move out the whole household. They can not leave kids or pets without a guardian. They can take any part of current funds from nothing to everything. If they take at least $1, that's what they end up in 'hood bin. If they take nothing - they receive $20.000 "government aid". After moving out sims can be found in main 'hood family bin. Not valid any more. Just for comparison or hystory. Family. Graduates or drop-outs may take other sims with them when they finally move out of Uni 'hood. Only non-YA sims may be taken. It's not allowed to leave kids or pets behind without a guardian. You won't get spanked for trying to move out all playables (this is normal for moving out of college). Timing. Sims may choose not to move out right away, but stay and tag along with other graduate or drop-out. 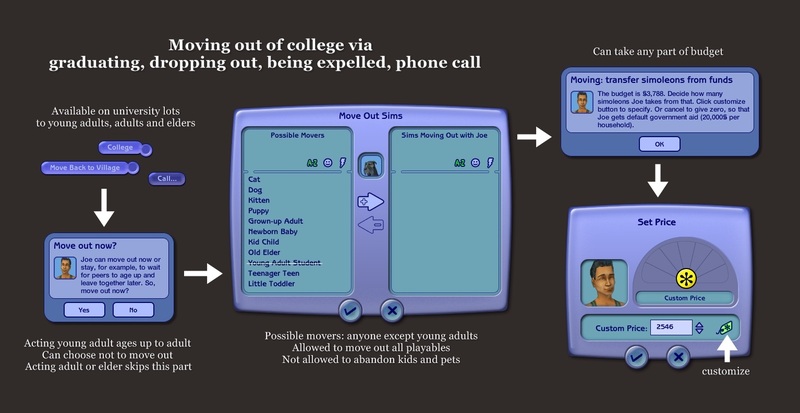 In this version, non-YAs can't move from uni to main hood through computer or paper, so make sure to grab them with other graduates or have sims from other household invite them to move in. Pick any amount of money from budget - and that's what they end up with in hood bin, even if it's 50 simoleons. Or cancel and make them receive 20,000 out of thin air (the usual). If all playables move out in one bunch and they have more than 20k in funds, they will take their money with them automatically. Job. Graduating sims on top of their part-time career get upgraded to full-time job in linked career. It's similar to teens' promotions on aging to adult, except teens don't have to be on top of their career to be upgraded, but the graduates do. I've made it to be like they've completed internship or something. Career level they end up on depends on meeting skills and friends reqs, with the 6th level as maximum. Drop-outs don't get to be upgraded. School bus picks up kids living on campus and delivers them to school (public or private) and back home. Also, the game processes school properly in uni (for example, checks if a kid missed school) and shows you school-related notifications. In dorms, the game reserves rooms only for specific ages of sims. Example: if your sims have a baby in a dorm, the game won't think that it needs a room, and it won't push a dormie to move out. Playable sims kid to elder still can claim doors - the interaction is there, if a door is free. If a wrong sim claimed a door, he or she won't be pushed out of the room, but you might be notified. If the sim has unclaimed the room and the game doesn't think he or she needs one, it will fill it with a townie soon. The mod only applies to dorms as a lot type located in uni hood (unless you have some kind of hack that makes dorm controller work in other subhoods or lots). Dorm room will not be reserved for anyone except young adults. Only students will be counted as sims, who need their own dorm room. Dorm room will not be reserved for underage sims and pets. But the grown-ups will be expected to have their own dorm rooms. Prevents the game from turning teens into young adults on university lots, other than dorms. This mod doesn't change aging process (6 pm thing). Normally sims wouldn't age on campus at all. If you'd like teens to age while living on campus, grab "Uni aging" mod. For teens to age up to young adults and become students, they have to move in to dorm. You can use phone option to enroll. Other types of lots leave teens be teens. When your sim tries to join a Greek house that has under-aged residents, the game will only use teens or older sims in the scenario. Children, toddlers and babies will be ignored. If the Greek household only has kids (unlikely, but still), your sim will not be able to join it. Maternity outfit fix for young adults - strongly recommended. Normally, pregnant students wear usual clothes that might not have pregnant morphs. The fix makes maternity wear fully available to them by default. Do these mods support dorms as well a private housing? What about Greek Houses? I tested different situations and made sure you should have no problems playing in dorms, private or greek houses. Giving multiple births, moving in and out with kids, splitting family between houses and dorms, moving back home as a drop-out, claiming dorm rooms by kids and then moving out, etc -- no problems. Of course, if you notice something odd, let me know. If I was playing with just a male sim, and he tries for a baby with someone who lives in the dorm (but still an NPC), will the child be born even though it's not controllable? A mother must be a playable, not an NPC or townie, otherwise there's no trying for a baby with her. Can YA's off the campus get pregnant? Yes. Bear in mind that being young adult and living in university are two separate things, technically. Does ACR work in conjunction with this mod? ACR and my mod won't clash, so you can use them together. Although, they will not always combine their functions in a way you might expect. As far as I know, ACR provides custom interactions, completely separate from vanilla ones. So, with my mod, 'try for baby' interaction will not be autonomous for YAs, it's just a vanilla 'try for baby' made available for YA sims. If you to click 'try for baby' on the menu, your sims may get pregnant with a certain % chance, as it happens in vanilla game. Although, there might be other ways for YAs to get pregnant semi-autonomously. For example, if you take a male adult sim and his young adult wife to a community lot downtown and have them woohoo in the photo booth with ACR, they may get pregnant. As for birth control function, I don't know how it works and I don't use ACR, so it's hard to tell without testing whether it prevents pregnancy in this case. Are the no20khandouts the Uni moveout compatible? Yes they are. YA-move-out-of-college takes priority when it comes to moving out of college, but no20khandouts still works in other moving out occasions. Load order doesn't matter, by the way. Check out my profile for news. You can see what I'm up to, download new stuff early on and share your thoughts. Pick no more than one mod of each kind.